Project ELX was started in February 2000 in Hyderabad, India. ELX Linux was a product of Everyone's Linux Pvt. Ltd (formerly known as 3T Solutions Pvt Ltd), a highly progressive organisation of young, dynamic and hardworking professionals yearning for perfection. It started with only 15 developers and today a brilliant team of over 25 Linux professionals have been working for ELX. ELX Linux was a fully featured Desktop Operating System with user friendliness as its basic feature. The easy-to-use desktop does not demand any learning curve for a typical Windows user and was very easy to use for a novice in computers. ELX comes with a vast variety of applications starting from word processors compatible with MS Word, other productivity applications like spreadsheets, presentation tools, and also CD burning applications. Rate this project Stanislav Hoferek has announced the release of Greenie Linux 6K, an Ubuntu-based desktop distribution optimised for Slovak and Czech users: "Greenie 6K is based on Ubuntu 9.10 'Karmic Koala', with many up-to-date applications, including Linux Kernel 2.6.31, GNOME 2.28, OpenOffice.org 3.1.1, Firefox 3.5, WINE 1.1.33 and also some new applications, such as Google Chrome (web browser), Imagination (slideshow creator), PDFMod (PDF editor), StarDict (a dictionary with support for Czech), Empathy (Internet messaging client, Pidgin is included too). Because of lack of free space on CD, several programs have been removed, including Inkscape, Alien and Mencoder. Greenie 6K also brings several changes to Greenie Toolbar, Firefox (with new speed dial), Bash aliases and graphic theme." Here is the brief release announcement. Download the installable live CD image from here: greenie-6k.iso (698MB, MD5). 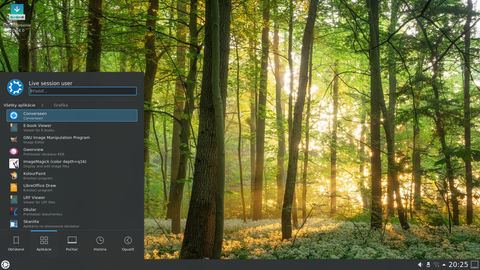 Stanislav Hoferek has announced the release of Greenie Linux 5J, an Ubuntu-based distribution and live CD optimised for Slovak and Czech speakers. What's new? Based on Ubuntu 9.04 "Jaunty Jackalope" (Linux kernel 2.6.28, OpenOffice.org 3.0.1), actualised with all recent security updates; new keyboard shortcuts for launching Firefox, calculator or any other application; availability of a meta package that can turn a standard Ubuntu install into Greenie Linux; new documentation; inclusion of Greenshot - a utility that takes a screenshot and uploads into to ImageShack in three seconds; availability of extra applications, including Skype, VLC and Opera via Greenport; new desktop theme.... Read the full release announcement (in Slovak) for more details. Download: greenie-5.0.1j.iso (697MB, MD5). Stanislav Hoferek has announced the availability of the third revision of Greenie Linux 4I, a user-friendly Ubuntu-based distribution optimised for use by Slovak and Czech-speaking users: "Greenie 4I R3 combines packages from the official Ubuntu repositories with those from GetDeb.net." Some of the more important changes in this release include: "Kino was replaced by Avidemux; Songbird was removed; several useful applications were added - AcetoneISO, Bleachbit, Deluge, Discwrapper, Gnome-format, GTK RecordMyDesktop, Gufw, and Reconstructor 2.8.1; Pidgin 2.5.5 works well with the ICQ protocol; some bug fixes. Also the lighter 'Galadriel' edition for advanced users is out now." Read the release announcement (in Slovak) for more information. Download (MD5) either the standard desktop edition or the lighter "Galadriel" edition from here: greenie-4ir3.iso (700MB), galadriel-4ir3.iso (408MB). Greenie Linux is an Ubuntu-based distribution customised for Slovak and Czech users. A new version, now based on "Intrepid Ibex", was announced earlier today: "A new version of Greenie Linux, based on Ubuntu 8.10 'Intrepid Ibex' is here! Main changes: Greenie is now based on Ubuntu 8.10, with new versions of the included applications and improved hardware support. Greenport has been re-written, it's easier to use even for beginners. Also, Bash aliases have been updated. Tutorials and drivers for most common modems from LinuxOS.sk are also included. Two Greenie extra menus, called 'Green apple' (experimental) and 'Red apple' (root) now work better and have new functions. Some of the popular programs in Greenie include: MPlayer, VLC, Audacious, Banshee, Firefox, Opera, Inkscape, GColors, WINE and many others, all in their newest versions." Visit the project's news page to read the complete release announcement. Download from here: greenie-4i.iso (687MB, MD5). Stano Hoferek has announced the release of Greenie Linux 3.1H, an Ubuntu-based distribution optimised for Slovak and Czech users, but also supporting English and Esperanto. The new version comes with a greatly modified list of Bash aliases, a Greenport service (online script gallery), a special menu with graphic effects and a new root menu. Greenie combines the standard system and applications from the Ubuntu repository (Linux kernel 2.6.24, GNOME 2.22.3, Firefox 3.0.1, OpenOffice.org 2.4.1) with some up-to-date GetDeb.net packages (Pidgin 2.5.1, Wine 1.1.4, Phun 4 beta). Also included is support for modems that are in common use in Slovakia and the Czech Republic. A custom Greenie Toolbar for Firefox with some interesting enhancements and links compliments the distribution. Further information on the new release is available from the project's home page and developer's blog (both links in Slovak). Download: greenie-3.1h.iso (699MB, MD5). Stanislav Hoferek has announced the release of Greenie Linux 3.0.2, an enhanced, Ubuntu-based distribution designed primarily for Slovak and Czech-speaking users. Some of the most important changes since Greenie Linux 2.x series include: based on Ubuntu 8.04; new versions of included applications; improved Bash aliases for easier execution of certain commands; addition of VLC as the default movie player; addition of gThumb as the default photo viewer; reduction of the distribution size to fit on one CD; removal of Frets on Fire, Wesnoth and MPlayer; inclusion of a third desktop environment - in addition to GNOME and Openbox, LXDE is now also available; various minor improvements and bug fixes. Visit the distribution's home page (in Slovak) to read the full release announcement. Download: gl3.0.2hgerfi.iso (701MB, MD5). The distribution supports Czech, English, Esperanto and Slovak languages. 2008-02-18 Distribution Release: Greenie Linux 1.2.8 "Battle For Wesnoth"
Stanislav Hoferek has announced the release of Greenie Linux 1.2.8, "Battle For Wesnoth" edition, a live CD featuring the latest version of the popular game. The freely downloadable CD image contains a light-weight operating system based on Xubuntu 7.10 with Linux kernel 2.6.22, Xfce, Wesnoth 1.2.8 with additional campaigns, Poedit (for Wesnoth translators), Gedit with ability to view WML syntax, GIMP 2.4, AbiWord, Xfmedia player, Firefox, Pidgin and gFTP (to send files over Internet). On the CD there are also binaries for Windows (Wesnoth stable 1.2.8, development 1.3.16) and Wesnoth 1.2.8 source code. Also Poedit is here for Windows, Mac OS X and Ubuntu. This is an installable live CD for players, WML programmers and translators. More information is available on the distribution's web site (in Slovak; the live CD itself is in English). Download: uwesnothcd.iso (698MB, MD5, torrent).